Do you think your school’s student section is the best in Connecticut, demonstrating the best mix of creativity, school spirit, and sportsmanship? NOW’S YOUR CHANCE TO PROVE IT! 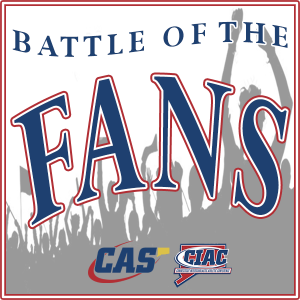 Take part in the 2018-19 CAS-CIAC Battle of the Fans (BOTF) and have your school recognized as the top cheering section in Connecticut. It’s now year #4 and we have seen increased participation each year, but we can do better. Will your school step up and show us what it can do? E-mail the link to your YouTube video to jcookson casciac org and cmiller casciac org. The winner will be announced prior to the CIAC Basketball Championships at Mohegan Sun, and the winning school will be honored as part of the finals March 16-17 at Mohegan Sun. 1/25 – Videos are due to be uploaded to YouTube by noon. 1/30 – Finalists are announced. 1/30-2/28 – CIAC staff visits finalists. 3/16-17 – Winning school recognized at basketball finals at Mohegan Sun.